A remarkable long day hiking across an outstanding volcanic area. Superb scenery (volcanoes within volcanoes) lava, bright coloured rock, bright mineral lakes and a perfect steep cone. Big views down towards Lake Taupo from the northern side of the massif. Interesting and varied vegetation, from high scrub to podocarp forest. This is a justly famous walk but it is popular in season. Ruapehu and Tongariro, the great volcanoes of New Zealand's central North Island, appear serene and ethereal above the surrounding heath and grassland. Between them stands 2,291m Ngauruhoe, an almost ridiculously perfect volcanic cone, a giant heap of rock and ash so regular that it looks as if it was deposited yesterday, which, in geological terms, it was. Ngauruhoe is a mere youthful pimple on the side of the Tongariro massif to its north, a cluster of much older craters whose explosions and eruptions have reduced the great mountain so that its parasite, Ngauruhoe, is now much the higher of them. Tongariro looks as close as the earth's surface can to that of the moon, three huge conjoining crater remnants, now wierdly flat, like particularly liquid cowpats. A selection of oddities lies scattered around them: violently coloured craters, huge solidified lava bombs, sinister jets of smelly steam hissing from the rocks and acidic, brilliant waterlogged explosion holes. The result of all this upheaval is some of the most dramatic, harshly beautiful volcanic scenery you will encounter anywhere, all compressed into a long day's walk. Many say that the Crossing is the best day walk in New Zealand with justice. The Crossing is also a stage of the three or four day Tongariro Northern Circuit, arguably an even better walk although a much bigger undertaking. 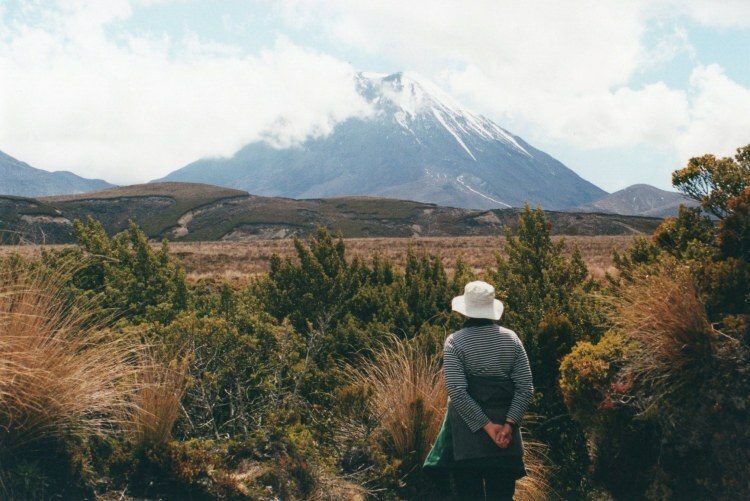 The Tongariro area was of great spiritual importance to the area's Maori people, and became New Zealand's first national park after it was given to the nation in order to preserve it from the encroaching settler way of life. The National Park is now a World Heritage Site for both its natural and its cultural attributes. 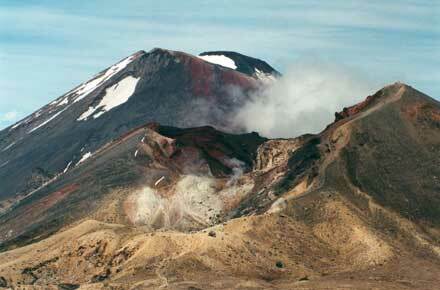 Some key scenes of the Lord of the Rings films were shot here, with Ngauruhoe featuring as Mount Doom. You are unlikely to be alone on the Crossing up to1,000 people a day are said to tackle the trail in summer. The weather is unpredictable at any time of year, so always come prepared for rain and cold. People usually walk the Crossing north-eastward from Mangatepopo. The trail heads off up a lovely valley through pale scrubby grass between the great uninterrupted sweep of Ngauruhoe's western slopes and a long ridge descending from Tongariro itself. A tough scramble up the harsh black rocks of the Devil's Staircase gets you to the Mangatepopo saddle. 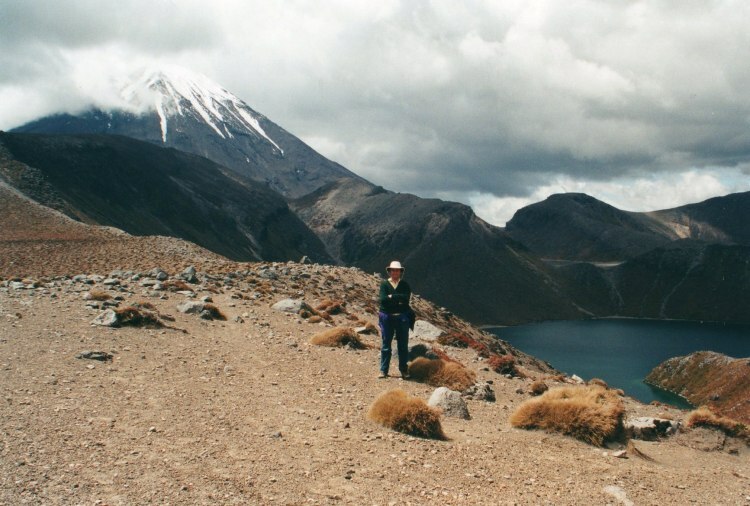 You can climb Mt Ngauruhoe from here: while the ascent is long, dreary and difficult, you are rewarded at the top by two concentric craters and extravagant 360 degree views. This is a three or four hour addition to the Crossing, so would make for a very long, tough day and should only be tackled by the very fit and experienced. The trail then crosses the floor of the South Crater, an extraordinary platter of water-washed cinders a kilometer across surrounded by steep broken walls, Tongariro's low surviving peak looming to the left, itself a rewarding and straightforward side-trip. A sweaty climb on red cinders reaches the highest point of the Crossing, a heap of cinder and pumice at 1,886m on the rim of the extraordinary Red Crater, a chasm violently ripped out of the mountain's side, a deep, angry red like a congealing wound. Sulphur steam rises from crevices among the boulders in the bottom. 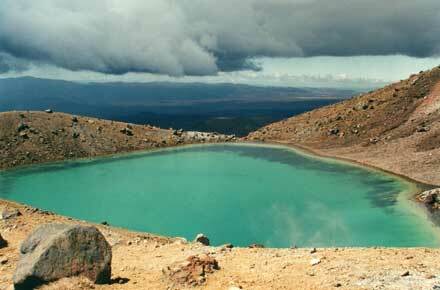 At the bottom of a steep, narrow scree beside the crater lie the beautiful but sinister turquoise Emerald Lakes. Further on is the beautiful Blue Lake, a larger and deeper lake filling a long-dead crater. The views from its northern shore are outstanding. A fine path gradually descends round the North Crater's flank, down to the Ketetahi Hut with its vast views out to Lake Taupo, past the hot Ketetahi Springs, to which access is neurotically prohibited. A steady downhill tramp takes you to a stunning hundred meter escarpment, clearly the end of a massive lava flow. In the grand valley below, a long trudge through lush forests gets you to the roadhead. Ruapehu and Tongariro, the great volcanoes of New Zealand's central North Island, stand aloof and unchallenged above the surrounding heath and grassland. When blanketed in snow, they appear serene and etherial above the verdant ridges of the approach from the north-west; but Ruapehu, particularly, is still very much alive, and eruptions have, within living memory, sent terrible cascades of mud into the valleys below.